When Dr. Birchler was 15, he was sidelined by a basketball injury. His father took him to the chiropractor, who helped him return to the game. In his teen years, he became interested in performance and its relation to diet and other aspects of health. “Chiropractic really resonated with me. I wasn’t there because I was sick but rather because I wanted to stay active.” He knew he wanted a career that would directly impact people in a positive way, and chiropractic was a perfect fit. Dr. Birchler attended Cleveland Chiropractic College in Kansas City, Missouri. There, he learned more about nutrition, lifestyle and how to assist his patients in attaining true health. Since then, he’s complemented his chiropractic education with many continuing education courses. He is a Certified Detoxification Specialist from the International School of Detoxification in Sarasota, Florida. 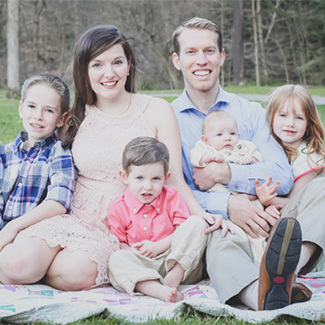 Dr. Birchler and his wife, Rachel, have four children: Liam, Evie, Rawling and Rowan. When he’s not at the practice, he enjoys spending time with his family. You might find him on the soccer field helping to coach through the Blackhawk Area Soccer Association, taking his daughter to horseback riding lessons, bouncing on the trampoline with his children or staying busy with church activities. Dr. Birchler is a member of the Best of Beaver County networking group and works out at Soulift. If you’d like to find out more about what we do, we welcome you to schedule a time with Dr. Birchler for a complimentary consultation. Contact our team today!